The Little Book of Hygge is published by Penguin and retails for £9.99. The cool-toned cover of this one perfectly emulates its content. With a grey and blueish design this is less the cosy side of hygge, but rather the stylish Nordics one. Filled with scrumptious recipes (such as Cardamom Doughnuts With Orange Blossom Honey and Smoked Chicken With Beets, Grains & Lentils), tips for design and lifestyle, and stunning photography, this book while also introducing the reader to the Danish concept is the more sophisticated older sister to its more colourful younger siblings. It is almost the next step up from The Little Book of Hygge; once people understand what it is and why it can bring happiness and relaxation, this is the how to guide to leveling that up. Worth it alone for the beautiful imagery woven throughout, and I'll be returning to this one again and again for the scrumptious recipes. How to Hygge is published by Bluebird and retails for £14.99. Finally, this book by Marie Tourell Soderberg falls in between the other two in that it has a lot of research/background to hygge like The Little Book of Hygge as well as gorgeous Instagram-inspired imagery and design like How to Hygge. It's the heftiest tome of the three but through plenty of spacing around the text and beautiful photos on each page, never feels like a chore to browse and read. This books feels the most personal one of the three, with recipes by people the author knows (easier and more simplistic than those in How to Hygge but sounding just as delicious) and personal anecdotes and stories from people woven throughout the pages. I also loved the additions of handy hygge phrases, the secret snow letters craft, and the hygge dictionary. Hygge: The Danish Art of Happiness is published by Michael Joseph and retails for £12.99. And these are my bookish recs for a hyggelig 2017! 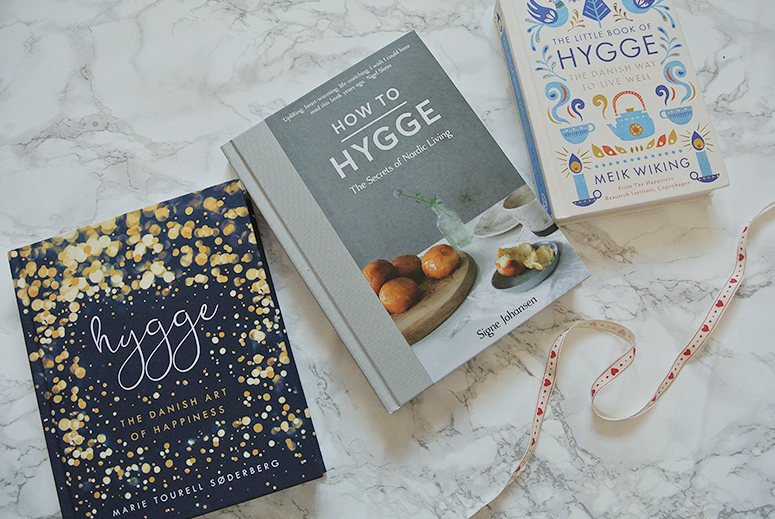 Are there any other hygge books or tips you'd like to share? Leave them in the comments below!